Special Containment Procedures: SCP-950 is to be stored in a well-lit room, with a video camera in one corner, and is to remain plugged in to an isolated electrical generator. The output resulting from the completion of SCP-950's activity must be handled with extreme caution; all non-Class D personnel must handle the laundry or any baskets containing the laundry with sterile gloves and hospital-grade masks. All output is to be inspected and photographed, as directed by the lead of SCP-950 testing. All articles output are to be incinerated afterwards, unless directed by the lead of testing. Personnel who wish to volunteer their own laundry must first be vetted, and the contents of their submission must be inspected before they are granted entry to the testing room. Description: SCP-950 is a black-colored dryer of the [REDACTED] series, from GE. All components match with usual examples of this series, though GE has never made them in black. When the machine is started, on any setting, any laundry within the machine goes through a normal tumbling and drying process. However, halfway through the determined cycle, the contents will begin to change or disappear entirely. When the cycle ends, and the door is opened, what is found is a collection of clothing entirely different from what was put in. 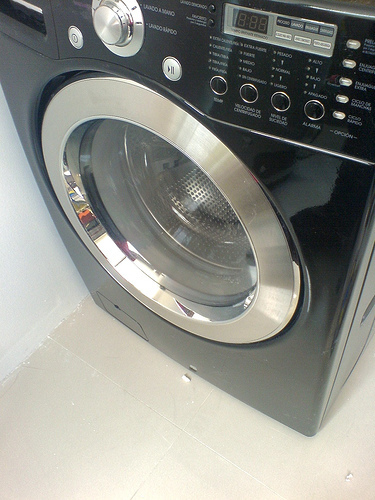 Input objects that are not clothing also go through this process, and end up as laundry in the same manner. When the machine is empty, the cycle runs as normal, and no transformation occurs. All tests have shown that the resultant laundry has never been seen before by the person who owned the input clothing. As well, in almost all cases, the output articles are much dirtier than those input, and are often covered in stains. Human (and other animal) bodily fluids of all known kinds have been recorded on various articles of clothing, and there have been several with contagious viruses, including Ebola and [REDACTED]. Occasionally, some articles have tears and cuts, corresponding to those that would have been made by various kind of weapons. DNA samples have been drawn from many of the output articles. Some samples match with those of victims of crime or disease, and more match with people who are listed as healthy, and suffered only temporary injury or illness. About 40% of the DNA samples are either animal DNA, or human DNA that has not been previously recorded in any database. Three articles have had residues of crushed insects of previously undiscovered species. One article [DATA EXPUNGED] no known life on Earth. Addendum: To better illustrate the condition of the output clothing, three excerpts from tests have been added. For photographs and complete transcripts of more tests, see document 950-Gamma. Five plastic wristbands, as used by modern morgues to identify bodies; each wristband had the name of a child that had died due to ingesting small toys or parts of toys. It should be noted that each name was traced to a different country, and that all five had died in the last year.